When Rob Gronkowski retired from the New England Patriots on Sunday, the topic shifted to whether he’s the greatest tight end in NFL history. There are arguments for others of course, but it says a lot about Gronkowski that he’s in the conversation. His career lasted just nine seasons and 115 regular-season games. He doesn’t turn 30 until May. But the greatness over that relatively short time is impossible to deny. While we’ll remember the catches and touchdowns, don’t forget Gronkowski was also a devastating blocker. Ask Colts safety Sergio Brown. Brown was trash talking Gronkowski during a 2014 game (the famous Jonas Gray four-touchdown game) and eventually Gronkowski drove him out of the end zone on a touchdown run, planting him about 10 yards out of bounds. Gronk was penalized and fined, but it was worth it since it resulted in a quote that became instantly famous. 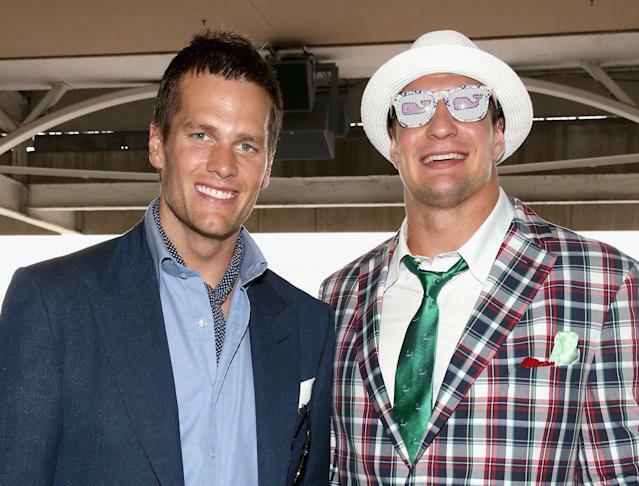 Oddly enough, two of Gronkowski’s greatest moments came in losing playoff games. Against the Eagles in Super Bowl LII, Gronkowski was dominant. He had nine catches for 116 yards and two touchdowns in a loss. That was overshadowed by him saying after the game that he would consider retirement, but it was another reminder that Gronk was at his best in big moments. Gronkowski was nearly impossible to bring down (which is why he was always susceptible to injury, with defenders tackling him low). There are many great stiff-arm highlights through his career, but one where he obliterated Chiefs safety Ron Parker in the open field last season has to be near the top of the list. Gronkowski’s legacy will primarily be as a great tight end, but he’ll also be remembered as a character in a league that doesn’t have too many of those anymore. Gronkowski’s party-boy image stuck early (and it wasn’t just in the NFL, Gronk’s dad said he picked the University of Arizona for the pool parties) and peaked when he answered an ESPN Deportes question after an AFC championship game with “Yo Soy Fiesta.” Only Gronk. And who else would roll into the Kentucky Derby looking like this? In 2011, Gronkowski’s second NFL season, he had 90 catches for 1,327 yards and 17 touchdowns. It’s probably the greatest single season for a tight end in NFL history. The highlight of that season was a 160-yard game against the Redskins in which he had a memorable catch-and-run through two Redskins defenders that had him wrapped up, and that day he also broke the single-season touchdown record for a tight end. Gronkowski finished with three rings (he was on injured reserve for the 2016 Patriots title team) but it took him — in Patriots terms anyway — a while to get his first. Gronkowski, in an epic battle against the Seahawks in Super Bowl XLIX at the end of the 2014 season, made one of the plays of the game, beating linebacker K.J. Wright and showing off some soft hands for a long touchdown right before the half. Gronkowski had some amazing hands, in addition to his other gifts as an athlete. But which of his amazing one-handed catches was better? Was it his crazy one-handed touchdown grab against the Bills? Gronk’s last season wasn’t great. Not to his standards anyway. But he was still the one Brady looked to in big moments. Against the Chiefs in the AFC championship game, Gronkowski made two clutch third-down catches. One was a 25-yard grab on third-and-5 to the Kansas City 4-yard line with less than a minute left. That pretty catch against Chiefs safety Eric Berry set up a go-ahead touchdown. Then in overtime, Gronkowski gained 15 yards on third-and-10, setting up the winning score. Without either catch, perhaps the Chiefs would have moved on to the Super Bowl instead. Gronkowski is a three-time Super Bowl champion and part of one of the great dynasties in American sports, so it’s a little weird that perhaps the best sequence of his career came in a loss. In the 2015 AFC championship game against the Broncos, with the Patriots trailing by eight points late, Gronkowski made two plays for the ages. He caught a 40-yard bomb over his shoulder against double coverage on fourth-and-10 to keep the game alive. There aren’t many tight ends in NFL history who would have their number called on a go route on fourth-and-10 (probably none who would get double covered on that route) and still make a play. Then to top it off, Gronkowski made a phenomenal fourth-down catch at the back line of the end zone, somehow staying in bounds for the touchdown. Most men his size don’t have that agility. The Patriots didn’t get the two-point conversion and the tie, but it was a remarkable performance by Gronkowski anyway. Not many NFL players get to go out on top. The league isn’t set up for storybook endings. Gronkowski got one though. While Gronkowski had a slow final season at times, the moment we’ll all remember from it was his last NFL catch. 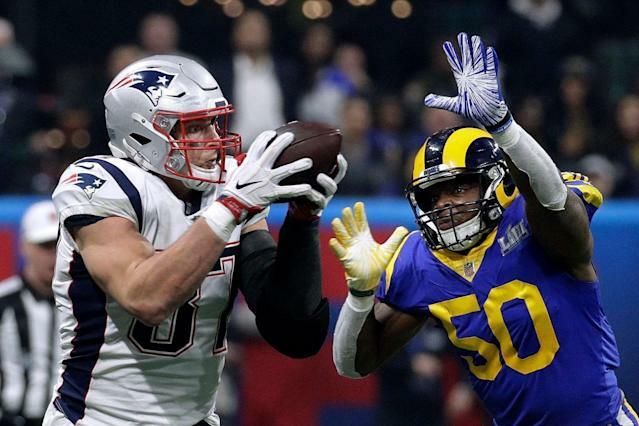 With less than eight minutes left in a 3-3 game, Gronkowski made a fine 29-yard catch to the 2-yard line, the longest play in an offensively challenged Super Bowl. The Patriots scored one play later and went on to win Super Bowl LIII. And Gronkowski got his final defining moment.